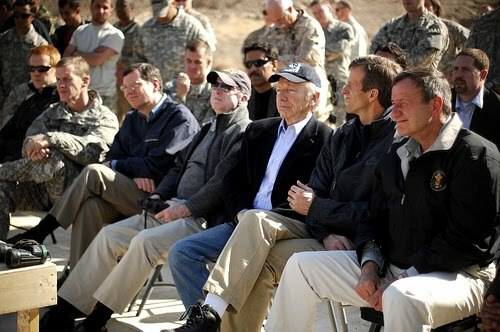 A delegation lead by Senator John McCain which included Senator Joseph Lieberman, Senator John Thune and Senator John Barrasso traveled to the Arghandab Valley in Kandahar, Afghanistan (above) to meet with troops and commanders of both the U.S and NATO military along with the ANA and ANP. They were accompanied by Gen. Stanley McCrystal and U.S. Ambassador Karl Eikenberry. More photos here from the Flickr page of US Embassy Kabul. We believe we have the right team, the right resources, and the right strategy. We are confident that if we stay the course that we can succeed here in Afghanistan as we have in Iraq. As I mentioned, we just came from Baghdad. The month of December, there was not a single United States casualty, an ample testimony to the success of the surge — the same strategy that is being implemented here in Afghanistan with very different circumstances, but the same fundamental strategy. We’re very proud of our team — Ambassador Eikenberry and General McChrystal, General Rodriguez and others — who I think have provided outstanding leadership. There are two concerns that I and my colleagues, who can speak for themselves, share. One is, of course, the mid-2010 departure date… excuse me…2011 departure date. That date, in my view, is artificial and should only be based by conditions on the ground. I was pleased by the comments made here by Secretary Gates and Secretary Clinton that this is an aspirational date and not a date that would necessarily mean withdrawal of U.S. troops. We cannot send a message to al-Qaida and the Taliban that they can lie low for a period of time and wait for us to depart. The other concern that we have is the issue of a sufficient number of trained Afghan troops. Our view, and that of most experts, is that we need 400,000 trained Afghan troops to take over the security responsibilities of this nation. So we will be seeking both the funding and the policy that would mean that the Afghan military can be built up to a total of 400,000 troops in order to fulfill the responsibilities and meet the challenges that they face. Read the full text of the remarks to the press by Senator McCain, Senator Lieberman, Senator Thune and Senator Barrasso (January 7, 2010). The McCain delegation also visited Baghdad on January 5. No way to tell what the senators did in Iraq because the only thing the US Embassy Baghdad has on its website is this notice “U.S. Senators at the Press Conference at U.S. Embassy Baghdad.” Oh, yeah – it also has a “gallery” of the visit containing five thumb print sized photos. You need a magnifying glass to see who’s who in those photos, of course; so I can’t tell if that is Big Foot attending the conference. Why even bother? Can’t say. The four-member congressional delegation also made it to Islamabad late Thursday to meet with Pakistan’s civilian and military leaders. The trip must have been a secret; there was nothing on US Embassy Islamabad’s website to indicate they were even in town. VOA and the Pakistani press, of course, confirmed the congressional visit. The bright side — at least the embassy there did not pretend to give us news or utterly useless photos of the visit. This Warden Message alerts American citizens in Sudan to a potential threat against commercial aviation transiting between Juba, Sudan and Kampala, Uganda. The U.S. Embassy has received information indicating a desire by regional extremists to conduct a deadly attack onboard Air Uganda aircraft on this route. While the capacity of these extremists to carry out such an attack is unknown, the threat is of sufficient seriousness that all American air travelers should be made aware. Air travelers on any airline and route should maintain vigilance at all times, and should report any suspicious behavior to the proper authorities. The Department of State continues to warn against all travel to Sudan, particularly in the Darfur area, where violence involving government forces, rebel factions, and various armed militias continues. American citizens who choose to travel to Sudan despite the existing Travel Warning, and those currently in Sudan, should review their security posture and take appropriate precautions.